All catches of quota species must now be landed and recorded, including undersized fish, and all landings now count against quota, even when the fish cannot be sold for human consumption. This makes vessels reluctant to land their unwanted fish despite the landing obligation, as it is using up valuable quota for no economic return. Administrations are planning to set up and hold reserve quota pools that such catches can be set against, rather than against vessel quotas. The hope is that this will encourage fishermen to land their unwanted fish, as they will not lose money by doing so. In England, the MMO is setting up a scheme that will use former so-called ‘uplift’ quota – additional quota derived from fish that would have formerly have been recorded as discards – as a reserve quota pool. In a letter to the industry, the MMO says: “The increase (uplift) in quota aims to allow sufficient quota for all landing obligation fish caught to be landed, including those previously discarded. This year, however, the Commission has not provided figures on what portion of the TACs relate to uplift quota. “Instead, DEFRA has calculated an equivalent portion of the English share of the UK TAC, based on 2018 discard rates, where available. That portion of England’s quota has been termed ‘reserve quota’. The ‘top-slicing’ of the first 100t, and then 10%, of uplift quota to the under-10s/non-sector will continue for most species. DEFRA will review the scheme annually. NFFO chief executive Barrie Deas said there was ‘a lot going on’ to try to make the discards ban workable, find a pathway to compliance, and work out how to deal with chokes. An industry meeting was held earlier this month with MMO and DEFRA officials to discuss the issues, and a meeting was held in Newlyn at the end of last week to discuss the acute choke risk posed by Celtic Sea cod. Irish Sea whiting is another high-risk choke species. There is also pressure from the EU Commission, and commitments were made at the December Council to develop discard reduction plans. 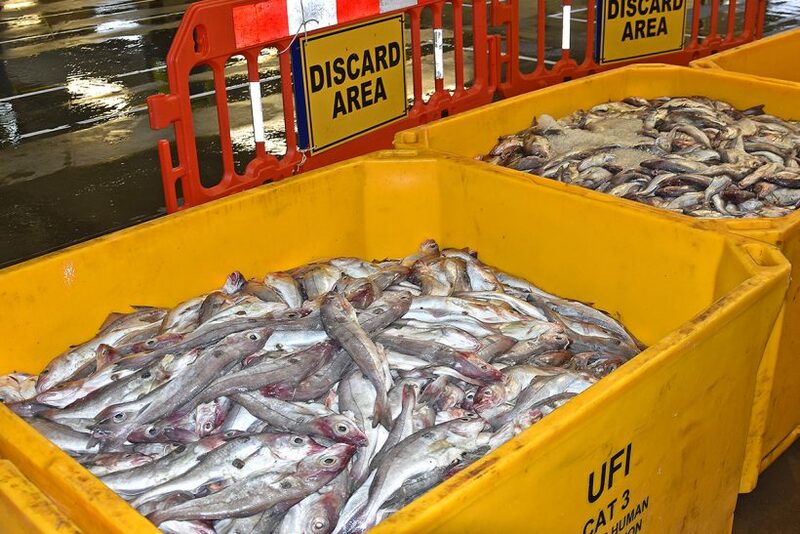 Barrie Deas said it was important for the industry to demonstrate that every effort is being made to reduce discards, particularly through the use of more selective gear and catch avoidance practices. A long-term worry is that if fishermen fish up to their quotas but then high-grade, fishing mortality rises. This would mean that higher fishing mortality would be recorded in the science, with a resulting recommendation of lower TACs the following year. In Scotland, Marine Scotland has proposed to hold quota pools to incentivise landings of below minimum size (BMS) fish for some key stocks. These include 50t of cod, 300t of haddock, 350t of saithe, 20t of whiting, 25t of hake and 50t of plaice. The Scottish Fishermen’s Organisation (SFO), Scotland’s biggest PO, says that most of the quota held in the reserve pool is from ‘windfall banking’ or compensation arising following the EU/Norway exchange. Writing in his latest newsletter, SFO chief executive John Anderson said: “The figures themselves are arbitrary – the reality is that no one knows how much quota is needed to cover landings of BMS fish for the remainder of 2019, particularly as discussions around changes to square mesh panel configurations are ongoing which – I would imagine – will have a significant bearing on the amount of BMS fish actually being caught. With regard to quotas and chokes, he said that it was still early in the year, but several potential choke scenarios were already anticipated, ‘given the sizeable cuts we have experienced, coupled with our government’s desired approach to maintain the status quo for the remainder of 2019, whether there is a deal or not’. He said that whiting would be ‘without doubt, tight’ this year, and that this was reflected in the monthly allocation – but that, on a more positive note, monkfish and Nephrops allocations had been increased, and the North Sea prawn fishery had had a good start to the year.